Temi is the world’s first truly intelligent, mobile, personal robot for home or office that utilizes autonomous mobility and navigation. Temi places users at the center of their technology, including smart home devices, online content and video communications – all harnessed by the power of voice. Featuring state of the art AI, and a system of 16 different sensors and cameras, Temi delivers great day-to-day value to its users. Temi recognizes its owners, distinguishes between different voices, and can assist with any smart task from playing music to ordering food. Temi is a self-learning machine that will familiarize itself with its users, their likes and preferences, to offer customized content and personalized services. This is the personal robot experience that many have always imagined, and using it is as easy as turning on a light. Telepresence: Temi allows users to be home when they’re away. Temi’s autonomous navigation gives owners the ability to spend time independently at home or office. When at home, they can enjoy hands free video calls as Temi follows them and keeps them at the center of the frame. Autonomous Navigation: Using the “Robox” – Temi’s proprietary navigation system, Temi constantly maps its surroundings, distinguishing between dynamic and static objects, enabling it to travel freely while constantly avoiding obstacles. Personal AI Assistant: Temi’s usability expands beyond video calls and has the AI assistant skills that users have grown accustomed to. Users can ask Temi questions, order services, food, plan trips, play games, etc., but unlike smart speakers these functions are supported by a beautiful on-screen UI making the experience very intuitive and much more informative. Entertainment: Content is enjoyed with high-quality audio thanks to a Harmon-Kardon designed sound system and a bright, rich 10 in. QHD display. Home Hub: Smart home devices can all be controlled through Temi and sequences for different day-to-day situations can be created for an even more custom experience. 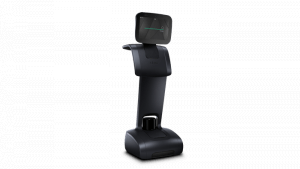 The Temi Personal Robot is priced at $1,499 and can be purchased through the Temi website. Estimated delivery is March 2019. Visit Temi at CES 2019 South Hall 2, Booth # 26621.